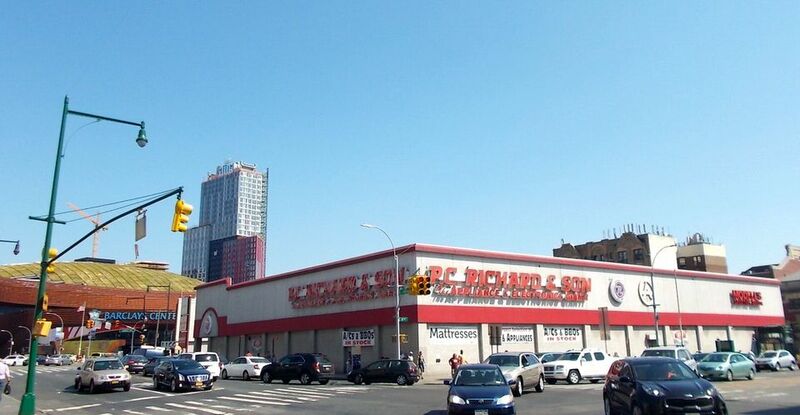 In a ruling that--if upheld--adds cost and complication to plans for an ambitious two-tower complex at a key Pacific Park site, a state judge has rebuked original project developer Forest City Ratner, saying it reneged on a promise to provide retailer P.C. Richard replacement space in that complex. That site across Flatbush Avenue from the Barclays Center, as of three years ago, was supposed to include the borough’s largest office tower, “an iconic office building for the new Brooklyn economy,” a spokeswoman for Greenland Forest City Partners told Crain’s New York Business. “Brooklyn's own version of Time Warner Center,” the CEO of original developer Forest City Ratner called the giant two-tower project at Site 5, currently occupied by P.C. 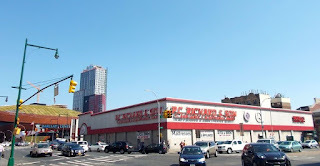 Richard and Modell’s Sporting Goods. The site is bounded by Fourth, Flatbush, and Atlantic avenues, and Pacific Street. Assuming that the judge's order requiring space to be provided for the appliance and electronics retailer stands, it's unclear whether Greenland Forest City Partners, the current developer, would accommodate P.C. Richard in a project otherwise expected to include upscale retail, or a financial settlement would be offered. 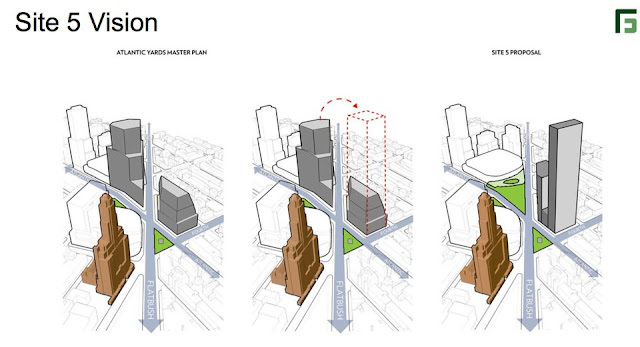 Whatever the resolution, the long-gestating two tower plan requires state approval--and public hearings--because it would involve the transfer of bulk from the unbuilt tower once planned for the arena plaza across Flatbush Avenue. The dispute has roots in the initial battles over Atlantic Yards, from its December 2003 announcement through its approval three years later, when Forest City took pains to ensure that P.C. Richard couldn't block plans for the 22-acre project, involving an arena plus 16 towers. The retailer has operated at that location—formally the Shops at Atlantic Center, and also Site 5 because of its designation in an urban renewal plan—since 1997, when the Atlantic Center mall opened across Atlantic Avenue. Parent company A.J. Richard had prepared to publicly challenge Atlantic Yards, including the expected use of eminent domain to acquire its property, according to Ash’s decision. Forest City, in 2005, proposed relocating the store, but the retailer said no, believing that the alternative sites lacked the advantages of the central location. Instead, in early 2006, Forest City proposed to acquire the retail property in exchange for a replacement property once the Site 5 tower—approved as a mixed-use building 250 feet tall, with some 440,000 square feet, far larger than permissible under the site’s zoning—was finished. In September 2006, as Atlantic Yards hit crunch time—approval was expected later that year, and an eminent domain case would be filed in October— Forest City sought to get a letter of intent (LOI) signed by A.J. Richard. Between September 20, 2006 and December 2, 2006, the parties hashed out the 12-page LOI, which detailed specifications regarding a 30,193 square-foot new space, such as electric service and a cooling system, plus parking spaces and a loading dock. The retailer would have to “go dark”—close and vacate within 90 days—but not until Forest City had its Site 5 construction financing in place. During the store’s closure, to make up for lost profits, Forest City would pay A.J. Richard $3.8 million per year. Forest City also would help pay off any mortgages regarding the property, up to $3 million. If Forest City didn’t deliver the replacement property within 18 months, it would have to pay penalties starting at $10,400 per day. A.J. Richard agreed not only to avoid challenging the project or the eminent domain plan, but also to cooperate with Forest City. After signing the LOI, for nearly 18 months the two parties exchanged drafts of documents to implement the transactions. However, on April 11, 2008, the retailer’s outside counsel told Forest City that it had learned that the developer aimed to market the new Site 5 building without space for P.C. Richard. Forest City’s outside counsel disagreed that the LOI was binding. Still, Forest City continued to discuss final implementing documents. Meanwhile, Atlantic Yards faced delays caused by legal challenges and the emerging recession; Forest City would downsize the planned arena and decouple it from the four towers planned around it, which were supposed to share mechanical equipment. Site 5 receded as a priority. In mid-2009, Forest City renegotiated deals with two state authorities, Metropolitan Transportation Authority and the Empire State Development Corporation (today Empire State Development, or ESD), gaining more time and better financial terms. Still, in a May 20, 2009 email, a Forest City executive told A.J. Richard that the implementing documents were “almost done,” according to the decision. They never got done. In October 2009, Forest City told A.J. Richard that, given the economic uncertainty, it was delaying plans for Site 5. Forest City told A.J. Richard, according to the judge’s paraphrase, that if it “ever developed Site 5, it would do so at the end of the Atlantic Yards Project, and that there was a good chance” it never would. Forest City stopped discussing the required documents. Then Atlantic Yards did move ahead: the Barclays Center opened in 2012, and Forest City began the first residential tower, via modular construction. Greenland in 2014 bought a 70% share of the project moving forward, launching three buildings as part of the joint venture, and changing the project name to Pacific Park Brooklyn. The unplanned plaza in front of the Barclays Center has become a crucial safety valve for arena crowds, and lauded by some as iconic. 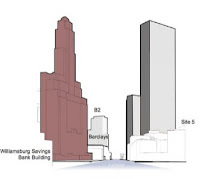 It became increasingly unlikely that Greenland Forest City would build the giant flagship tower at Atlantic and Flatbush avenues that original architect Frank Gehry had dubbed “Miss Brooklyn,” given the value of the plaza and the disruption that construction would cause. 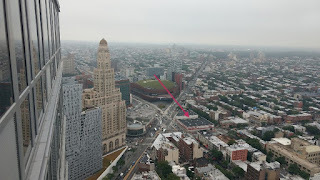 But no developer walks away from usable development rights; the joint venture hatched plans to transfer most of Miss Brooklyn’s unused bulk across the street to Site 5, creating a much larger two-tower project. ESD also appraised the P.C. Richard property, coming up with a modest $15.1 million valuation for a building occupying a 25,000-square-foot lot. Such valuations are often increased after litigation. A.J. Richard fought back. In late October 2015, it told Forest City it considered the LOI binding. Forest City disagreed, and said it had no plan to provide a replacement space. On Dec. 4, 2015, A.J. Richard went to court, charging breach of contract, among other things. Two months later, a judge granted a preliminary injunction blocking Forest City and those acting with it from proceeding with Site 5 plans. In the interim, Greenland Forest City had gone to the Department of City Planning, promoting a two-tower project containing more than 1.1 million square feet, with one tower rising 785 feet. The potential high-end retail at its base was likened by one executive to the Time Warner Center—a far cry from a basic big-box store. After all, an Apple Store and a Whole Foods 365 now operate in the 300 Ashland tower barely one block to the north. After the adversaries filed documents and depositions, the judge issued a summary judgment before any trial. Forest City argued that, because the LOI required future negotiations, as well as a condominium offering plan, it was non-binding and unenforceable. Justice Ash disagreed, noting that the LOI “used mandatory terms with respect to the parties’ obligations,” and “set forth a mechanism for the termination” of rights granted. “[T]here is no question that Forest City has repudiated its obligation to consummate the agreed-upon transaction with A.J. Richard while proceeding with the redevelopment of Site 5,” she wrote. Though Forest City contended that the six-year gap in negotiations indicated that the deal had died, Ash said the company had suspended the process. The legal battle could continue for many months, at minimum. The "iconic office building" has long been stillborn. According to periodic public statements by the state and the developer, the Site 5 project has long seemed close to launch, requiring a public process--likely a year long--to change Atlantic Yards’ governing General Project Plan, but has never done so. Public entities’ willingness to approve larger buildings near the Atlantic Terminal subway hub has increased, given the City Council’s approval of the two-tower 80 Flatbush project little more than a block north. That suggests even less likelihood that the proposed changes in bulk and scale at Site 5, to be reviewed by the gubernatorially-controlled ESD—which typically green-lights changes in the project—will face resistance. Still, if the decision stands, the costs to Forest City (or the joint venture) of resolving the dispute with A.J. Richard have grown, whether that means providing space in the new complex, or paying a presumably significant settlement.